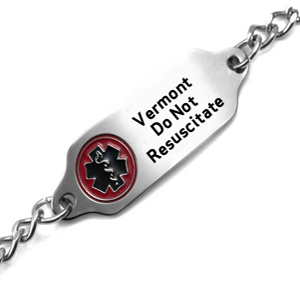 StickyJ Medical ID Jewelry is authorized by the Vermont Department of Health as a vendor of Do Not Resuscitate identification bracelets. 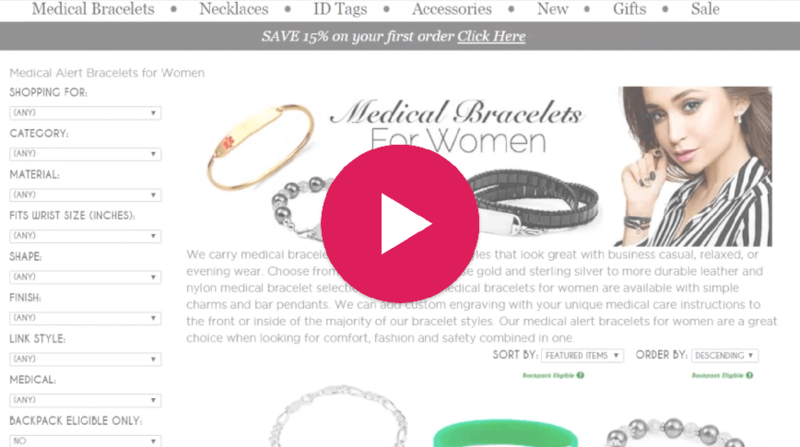 The metal bracelet displays the internationally recognized Staff of Aesculapius medical symbol on the front along with the words Vermont Do Not Resuscitate. We will engrave the patient’s Name on the first line of the back of the bracelet, and Date of Birth and Gender on the second line. Please provide that information on Engraving Lines 1 and 2 when ordering. We will engrave the words Order on File followed by a unique 6-digit identifier on line 3 of the back of the DNR ID, and we'll engrave the toll-free phone number of our DNR verification service on line 4 of the back of the DNR ID. A copy of your signed DNR order on the Vermont DNR/COLST form must be faxed or mailed to StickyJ Medical ID prior to releasing your order. You can either scan the signed document and send it to us by email (CustomerService@StickyJ.com), or Fax it to us at 727-490-5446, or mail it to: Customer Service, StickyJ Medical ID – DNR, 10801 Endeavour Way, Unit B, Seminole, FL 33777. If you have any questions, please call us at 727-823-9500. Up to 2 lines of 22 characters each, including spaces!